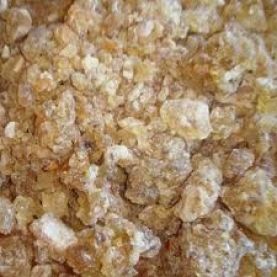 This is an exquisite organic frankincense resin. It is of the highest quality and has an elegant soft scent when burned. It is uplifting, comforting, cleansing and offers energetic protection. The Boswellia frereana resin is a bit stronger and bolder than the caterii, but is still mild. Both are absolutely beautiful though and they are wonderful combined together. Frankincense resin begins as a milky-white sticky liquid that flows from the trunk of the tree when it's injured. The purpose of the resin is to heal the tree. Frankincense resin flows when a tool called a mengaff is used to scrape about a five-inch section down the trunk of tree. It is after the tree is scraped, a milky white juice begins to flow. This white juice hardens into yellow "tears" when exposed to the air. That specific tree is then marked and the harvester returns to scrape and collect the hardened frankincense resin from the tree. The large, clear globules are scraped off into baskets and the inferior quality that has run down the tree is collected separately. This particular resin is from the Boswellia frereana tree and is found growing in Somalia-land, There are may different Frankincense species, but in our opinion, the frereana species is very powerful. The aroma is delightful, soft, soothing and very smooth. In fact, the locals used to chew on this resin for its anti-inflammatory properties. Way back in biblical times, both the resins of Frankincense and Myrrh were highly treasured.